Have you ever stopped to contemplate that literally all that we are and all that we have is of God? What an awesome concept! Therefore, our response to that Creator God is to give back. There is no greater joy than being in a position to share our gifts and resources with those in need. If we have enough, but others are lacking, we remind ourselves that God already created a world of plenty, and that it is up to us to distribute and share what we have with those who don’t have enough. 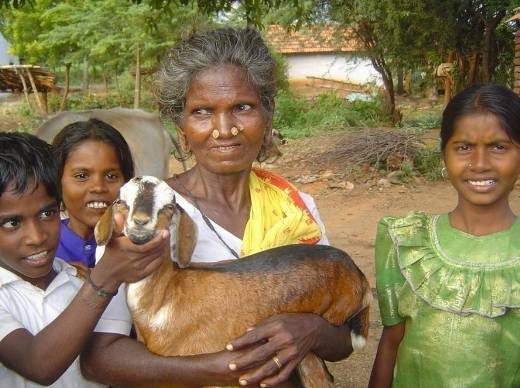 I vividly recall this remote village in northern India and the looks in the eyes of the children and the woman, pictured above, when they received a goat from Week of Compassion. This goat would change their lives! One goat! How wonderful it felt in that moment to know that what Disciples had given was now improving the lives of an entire community. What joy! This Week of Compassion special offering season, February 19-26, we continue to discern how “Sharing Brings Joy.” This Week of Compassion we hope you will lift up how that sharing blesses, transforms, and brings joy to others. In a time of uncertainty, fear, and continuing economic hardship in our country and in our world, I can think of no better offering to give back to God than our profound joy in knowing that we do, indeed, have all we need-—and more. For “the point is this: the one who sows sparingly will also reap sparingly, and the one who sows bountifully will also reap bountifully. Each of you must give as you have made up your mind, not reluctantly or under compulsion, for God loves a cheerful giver.” (2 Corinthians 9:6-7) The early Christians are encouraged here to share the joy in giving by letting others witness their generosity so that all may see how God is being glorified and how others’ lives change as a result of our generosity. For more than six decades, Disciples of Christ in the United States and Canada have shared material resources with a hurting world through Week of Compassion, bringing glory to God as well as joy to others. God’s people giving of their resources-—prayer, money, time, talent—-remains the propellant behind Week of Compassion. The act of giving back to God is simply a matter of faith. It is the natural reaction to our saying “yes!” to following Christ. Sharing with others invites God more fully into our lives. As we reach out in love, we open the way for God to reach more deeply into us. Sharing will joyfully transform you as you help transform the world. This year, as you share your tithes and offerings with Week of Compassion, remember all the ways your gifts bring joy to others. Sow bountifully and share abundantly, knowing that you are not only helping change the statistics, you are also helping change lives. May we all give cheerfully and multiply the joy! If you have any questions about how to promote the Week of Compassion special offering, do not hesitate to contact us, or visit our website.